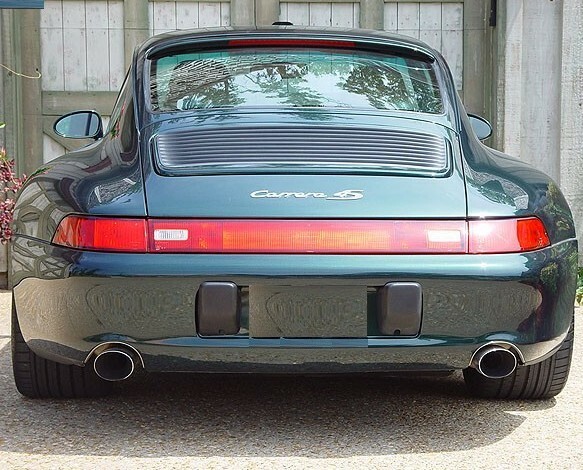 Every Porsche is a bit unique in that they have their own set of distinctive features and quirks that we as owners come to know and love (or hate) over time; the Porsche 993 is no exception. I’ve assembled below, from various sources, a list of the features about the 993 (some well known, others not so much.) If my list isn't complete, or you think something is incorrect, please let me know. By removing the intermittent wiper relay you can park your wipers on the passenger's side of the windshield. The only cost is your intermittent wiper feature is disabled. Narrow-body 993s came standard with 16" alloys, which makes the stock "SUV" ride height even more silly looking. Almost all 993s upgraded to the 17" wheels. If you want to stop your rear spoiler from flapping up and down continuously, just depress it once in the up position when the vehicle exceeds 10mph. The mirrors on the car are not symmetrically positioned. The steering wheel is slightly off center relative to the drivers seat. The roof line and luggage compartment is not only identical to the 964's , but remains unchanged since 1974. The body of a 993 is not mounted on a chassis in the center, it's slightly towards the passenger side. The word Varioram was not cast onto the intake until about half way through the '96 production year and not all cars received this treatment. Engines in the Turbo models sit 40mm further back in the compartment compared to non-turbo cars. Did I miss anything major? Let me know. What about other models? What are the quirks of the early 911s, 930, 964, 996 and 997? What about the Boxsters and Cayennes? Let’s not forget the 924, 944 and 968s. Wow, why, are any other cars like this? The 964s have two oil filters — one by the engine and another under the driver’s side sill IIRC. Always thought that was a little different, but with oil being cooled in the front of the car, I suppose it’s a bit of a necessity. The 993 has two oil filters too. A large and a small. The small one is a pain to get out when changing the oil!!! THere is only one oilfilter in the 964 and 2 in the 993!